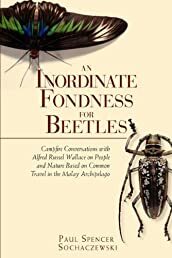 An Inordinate Fondness for Beetles follows the Victorian-era explorations of Alfred Russel Wallace through Indonesia, Singapore and Malaysia. While Wallace is recognized as co-discoverer of the theory of natural selection (and was perhaps deliberately sidelined by Darwin) he was also an edgy social commentator and a voracious collector of “natural productions". Sochaczewski, author of Sultan and the Mermaid Queen and co-author of Soul of the Tiger, has created an innovative form of storytelling - combining incisive biography and personal travelogue. He examines themes about which Wallace cared deeply -- women’s power, why boys leave home, the need to collect, our relationship with other species, humanity’s need to control nature and how this leads to nature destruction, arrogance, the role of ego and greed, white-brown and brown-brown colonialism, serendipity, passion, mysticism -- and interprets them through his own filter with layers of humor, history, social commentary and sometimes-outrageous personal tales.